I recently visited Joost Bongaerts, floral wholesaler and owner of Florabundance. Yet many of these florists whose operations are not large enough to guarantee sizeable orders or meet minimum purchase requirements face a dead-end when they ask their local wholesaler to provide domestic or locally-grown product. The wholesaler is basically a broker, an agent between the grower and the designer. The way the wholesale florist makes money is to buy low and sell high. I know this is an essential truth in any modern-day distribution system, but – to me – it can lead to a situation where the wholesaler holds all the power to set price, to determine what is brought to market, to manage the flow of goods from producer to end user. And in floral, over the years, that set up has led to a near-total obscurity of sourcing and certainly NOT truth in labeling. It has been close to impossible for designers seeking flowers from the wholesaler in their town to ever know WHERE those flowers came from or WHO grew them, let alone what growing practices were used. So . . . in the coming months, in an effort to crack the code and inspire more wholesale florists to “see the way to the future,” I’ll be featuring conversations with the ones who are committed to transparency in their sourcing practices. Today, we’re kicking it off with Joost Bongaerts, owner of Florabundance in Carpinteria, California. Born in 1959 in Den Hague, The Netherlands, Joost grew up in Holland. His father managed agricultural land holdings all over the country. Joost spent summers working on his family’s farm in northern Holland and became interested in agriculture and horticulture as a result. He attended The Land en Tuinbouw School in Dordrecht and continued his education in Gouda, graduating with a degree in plant science. Joost also spent a semester at Michigan State University as part of an exchange program, which led to his desire to work and live in the United States. Joost began his professional career in 1981, marketing fresh cut flowers from Holland for The Dutch Flower Auctions & Exporters Organizations which was located in Livonia, MI. From 1983 to 1991 Joost worked for several Dutch companies selling flower bulbs and perennial plants to specialty cut flower growers in the United States and Canada. In 1991 Joost and his wife Alexandra opened BonFleur, a European-style retail flower shop in New Canaan, CT, which they sold to their manager in 2002. During this time Joost also imported flowers from Holland and started to do business with Florabundance, becoming a partner in 2002 and eventually full owner in 2008. Joost’s background and experience in selling flower bulbs to growers, importing cut flowers and running a successful retail flower shop provides a unique perspective from which he has developed the Florabundance brand into one of the premier wholesalers in the United States. Here’s a bonus feature: a UBloom episode about Florabundance, produced by J Schwanke for his California Grown Experience video series. 1. Other wholesalers will begin to hear the buzz – and they’ll be curious about the successes of their peers like Florabundance’s Joost Bongaerts. 2. More florists will point to these examples and nudge along their own wholesaler, asking them to source domestically, seasonally and locally – for good reason. 3. The consumer will benefit – and have more confidence in the purchases he or she makes. Please send me your suggestions for who you’d like to hear from on future episodes of the Slow Flowers Podcast. And tune in next week to hear from a special guest. Author Amy Stewart, who wrote Flower Confidential in 2007, will join me for a conversation about that groundbreaking book. Don’t miss it! Because of the support from you and others, listeners have downloaded episodes of the Slow Flowers Podcast nearly 11,000 times! I thank you for taking the time to join to my conversations with flower farmers, florists and other notable floral experts. The Slow Flowers Podcast is engineered and edited by Andrew Wheatley. This entry was posted on Wednesday, April 30th, 2014 at 5:40 am	and is filed under American Grown, Blog Posts, Creativity, floral design, General, Podcast Episodes, SLOW FLOWERS Podcast. You can follow any responses to this entry through the RSS 2.0 feed. You can leave a response, or trackback from your own site. Great thoughts and aspirations for the wholesale sector. On any typical week the offerings from my local wholesale markets are 80-90% imported. A dilemma for sure. Using local grown is a wonderful thing if you are in a populous and temperate clime, but the rest of country is difficult. As a professional florist you have to stay within the perimeters of many traditions and wants of what the consumer is used to, and not everyone wants wild garden flowers in their sympathy tributes & birthday vases or succulent boutonnieres. Therein lies the problem for traditional florists and wholesale markets. A florist is a business with certain expected offerings, the opposite of a farm stand. 3. at a fair cost because Fedex fees will out price the product. However, at the start I learned straight off that most good, wholesale houses and flower markets really do stock enough US flowers to fill your cooler and still do. They will also order in anything you request if you ask as they have the knowledge of who is growing what. I still, never offer chrysanthemums or carnations as they are all imported, but there are plenty of others to tempt a customer. I also discovered that it was not having 40 different varieties from all over the world every week that appealed to the customer-but yet the creative way they were put together and designed. After all, design is what a professional florist is all about-not just wrapped bouquets. Thankfully, with green, local, and seasonal now vogue; my customers have learned that every season brings different varieties which equates to an excitement for flowers again. In these times quality is now paramount in purchasing, and nothing compares to the longevity, scent, and freshness of cut and next day shipped, US flowers. I owe kudos to the few early thinkers who had the foresight to get things going like Gerald Prohlman, original founder of Organic Bouquet who inspired & helped me more than I can say. And to Charity at Mayesh and Chad at Eufloria for being some of the first to ship to me back then and still do. 🙂 It takes an effort and tenacity, but hopefully more florists will see the benefit of buying US grown which will trickle down to a demand for more US options at the wholesale houses. Further, that they realize that flower consumers will indeed pay more IF they are getting the freshest and most beautiful flowers alive, supporting our own economies, and last twice as long as their imported counterparts. Hi Lynn, thank you for taking the time to write such an insightful letter! You’re inspiring me – and I hope I can invite you to be a future guest of the “Slow Flowers Podcast,” okay? I know our listeners and readers will feel a sense of optimism in reading your description of how to work with wholesalers – and how to ask them to source American grown flowers. That is such good news!!! I have to respond to a few of your comments, based on my own research and investigation, however. 1. Chrysanthemums are alive and well in many greenhouses in California. Please visit http://www.oceanbreezeintl.com in Carpinteria, CA to see what they grow. Their mums are very special and feature interesting bi-colors and contrasting centers! 2. While the majority of carnations are imported, the domestic U.S.-grown carnation is having a comeback. I’ve heard that some specialty cut flower growers are experimenting with unique carnation varieties. 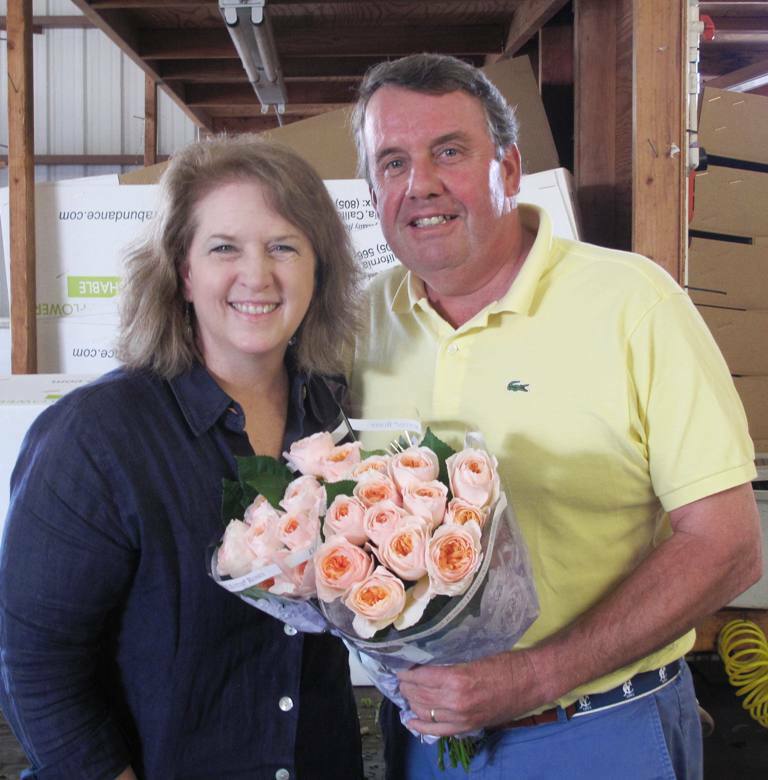 Right now, there is still one commercial carnation grower in the U.S. – please check them out! Akiyama Nursery in Watsonville, Calif., is the country’s last remaining carnation grower. Other growers, including Robert Kitayama of KB Brothers Floral Farms (also in Watsonville) are working with the Akiyamas to save the U.S. carnation. 3. While I agree that Organic Bouquet’s original mission helped to raise awareness among consumers who are concerned with eco-friendly growing practices, I am dismayed to see that company stray so far away from US domestic grown flowers. When you search “American Grown” on Organic Bouquet’s web site, there are literally NO matches. When you search “US Grown,” you get several packages of blooms that benefit charities, but there is no indication that the flowers are domestic. They are imported roses, peruvian lilies and other offshore floral product….that upsets me. I believe that domestic flowers are always going to be more sustainable than eco-certified imported ones. It’s too bad that Organic Bouquet hasn’t taken a leadership role to promote American grown. 4. I applaud Mayesh for their recent American Grown promotion to florists. When I saw their promotion, I knew that my message (and the voices of so many others like you) had finally resonated with a major wholesaler. 5. I, too, give huge kudos to Eufloria for hanging in there as one of the last dozen or so US rose farms. Their roses are beautiful and the highest of quality.